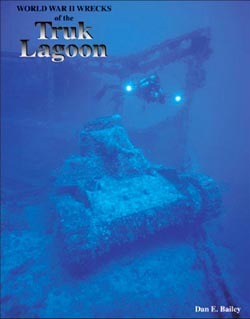 The 2001 first edition of WW II Wrecks of the Truk Lagoon is now available. This book has been a concentrated work in progress since 1992 and includes a great amount of never before-published information resulting from new diving discoveries and further archival research. Descriptions of the artifacts, war supplies, and armaments. Drawings of wrecks showing important features. War histories of the ships. Details of the Operation Hailstone, April 29-30, 1944, and Army Air Force aerial campaigns against Truk. Aerial combat between Japanese and American planes. The Japanese response to Operation Hailstone. Atrocities against captured American flyers. Technical deep diving at Truk. Diving requirements and skill levels needed. This book has the most detailed and complete compilation of information regarding the Japanese occupation and build-up of Truk into a strategic naval base, the air campaigns against ships, aircraft, and installations, and the exploration/descriptions of the ships and aircraft wrecks ever written. The text is complemented by 150 color plates, 101 black and white photos, and 173 graphics (maps and illustrations). *US orders will be sent by Media Mail or Regional Priority Mail Flat Rate shipping and you will be charged actual shipping costs. International shipping rates apply on non-US orders. All transactions are handled via the NVDP secure transaction server so you never have to worry.